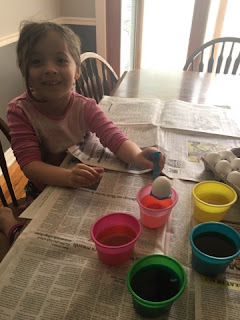 Yesterday was a major win in my book for coloring Easter Eggs. This year with my kids being 5 and 20 months, I went the simple route. Last year I bought coloring egg cups on sale after Easter and put them away with the rest of my Easter decorations. The kit came with 5 colors (pink, orange, yellow, green, and blue) and a crayon. The crayon however did melt in my attic, but I was ok with that. It made doing eggs quicker and easier for my kids. 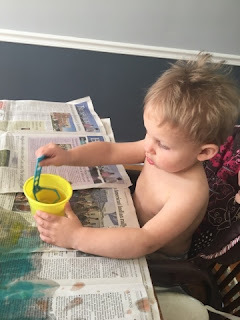 The kid was simple 1/2 cup of water, 3 tbsp of vinegar, and 1 tablet to make the colors. (minus pink you didn't use vinegar. 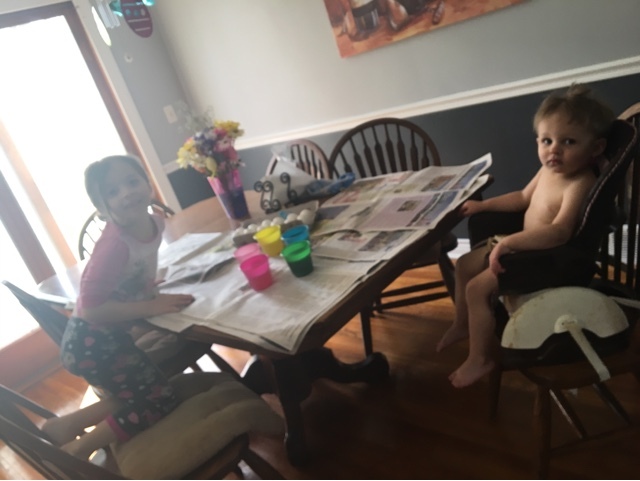 Both kids were so excited to color eggs. Austin tried to pull the paper off the table, and Ella wanted to do 11 eggs and Austin only to do 1. They both ended up doing 6, well Austin did 5 cause he dropped one of the floor and it cracked. 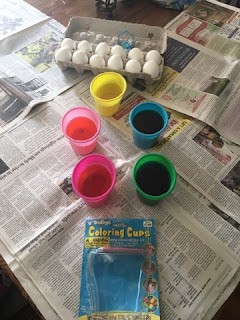 Dyeing Easter eggs has always been one of my favorite parts of the holiday. Plus I love eating deviled eggs. Now as an adult I love egg salad made with avocado, relish and a little mustard. Ella seems to also have the love of coloring eggs. We did this yesterday and today she already asked if we could do it again. Even though Austin is really to young to understand, he still had fun. We only had one egg dropper/scooper so they did argue over it. Somehow Austin ended up with blue dye under his armpit, it will go away eventually. This is why I made Austin naked. I would rather clean him then have ruined clothes. Ella had on old pj's that she was fine with possibly getting stained. 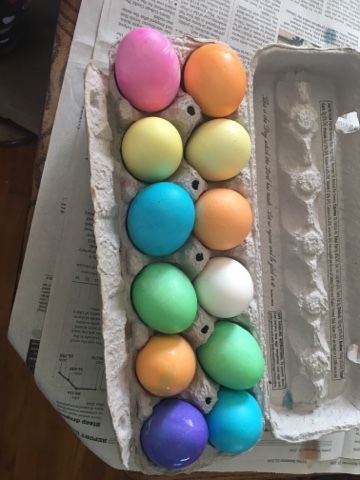 I on the other hand had half my hand colored different colors since I was using my hands to remove eggs. They did pretty much come clean after I took a shower. I love how bright and vibrant they turned out. With one egg Ella made purple. She loved seeing how using pink and blue would do that. She is always trying to mix crayons and get a certain color but that doesn't work very well. Little tip, We always save the cartoon to put the eggs back in for easy storage in the fridge and less chance of the eggs getting broke, unless you are like Austin and just drops it on the floor.